See what you missed? See what you missed by not being at the April meeting? 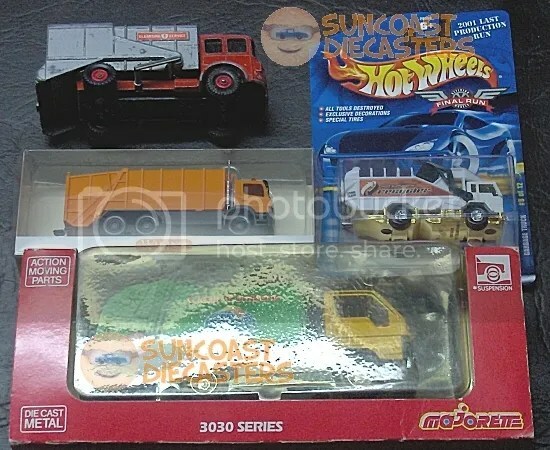 Two scrumptious boxed sets of 1/64 goodness. 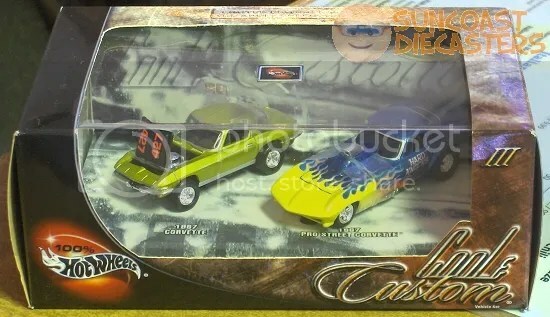 Whether it’s street rods, classics, heavy machinery, krazy kustoms or whatever, you’re sure to find something awesome and wonderful at a Suncoast Diecasters meeting. 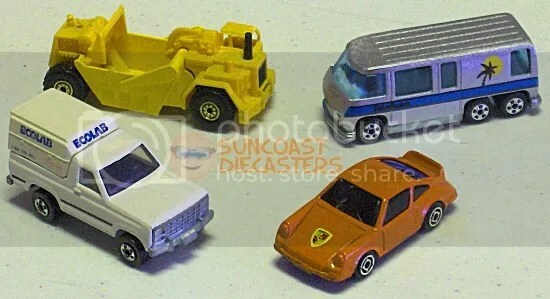 Ken does very nicely for hisself, acquiring among (two) other things a rare Gold CT variation of the CAT Earth Mover, and the rare EcoLab variation of the Bronco 4-Wheeler. Zylmex Datsun Pickup, courtesy Big Tractor Mike. Don’t know if the “stuff” inside the topper is support for windows which have since gone missing, or simply an unfinished remnant of the molding process. Regardless, the truck is in great condition with really nice coloring. I’m glad I bought it! 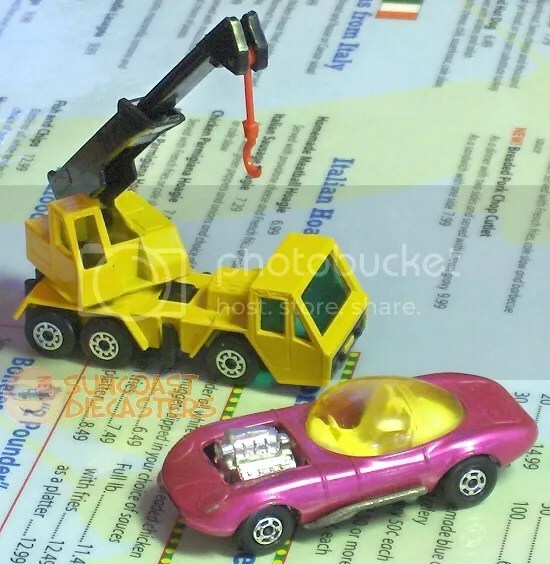 Tom also removed from Jim’s possesion this ’83 Speed Machines variation of Dumpin’ A. 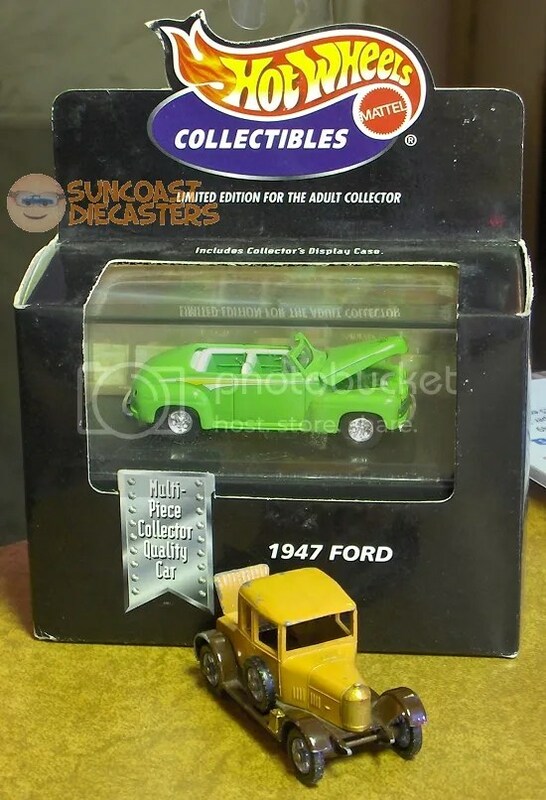 …And this Collectibles-edition sweeet green ’47 Ford. 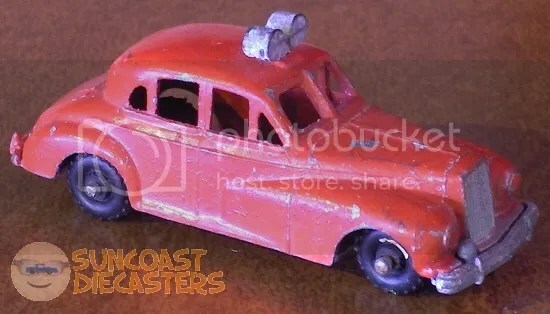 Coolest of all, however, am the Matchbox Models of Yesteryear ’25 Morris Cowley “Bullnose”. Yes, I said 1925. A rare thing happened at the March meeting: Big Tractor Mike actually bought cars from me! The ubiquitous TV Van, and Cosmic Blues (which I’ve only seen in Orange and Green). And what did I get? This!!! 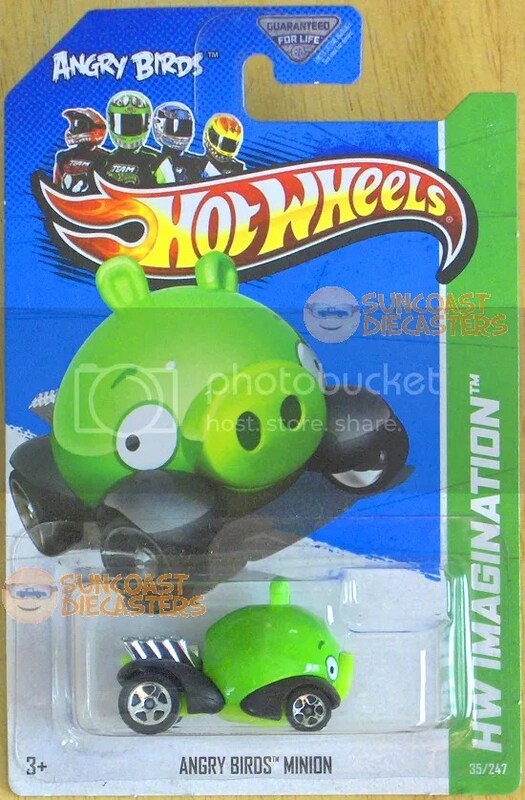 Yep, the Angry Birds “Minion Pig” car (or Minion Pig “car”). For Christmas I got my nephew the Hot Wheels Angry Birds track set, which came with the “Red Bird” car (or Red Bird “car”). I wanted to get him the Pig so’s he’d have, you know, “the whole set”. Couldn’t find one. Mike did, and traded the above cars (or “cars”) for it. Thanks, Mike! Tom purchased this from Your Humble Webmaster. Lightbar’s kinda funky lookin’, but otherwise it’s a nice model. Good condition, opening doors, and best of all, the friction motor still works! 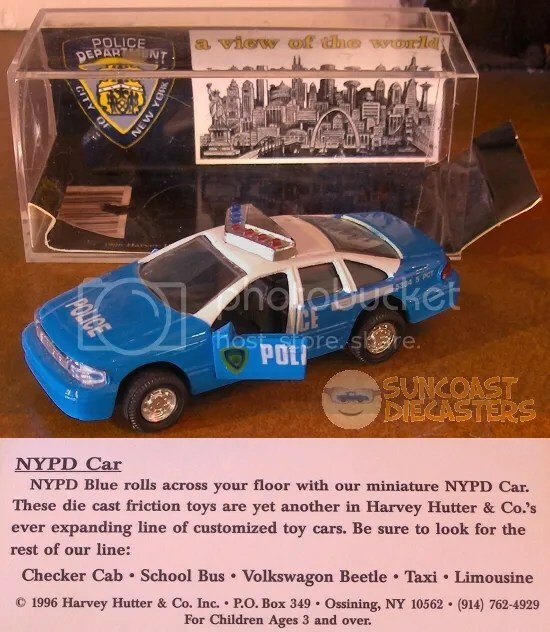 The (scanned) text beneath the cruiser is what’s on back of the insert in the case. For those of you who might wonder if “Harvey Hutter & Co” is still in business, happily the answer is yes! …I hope you like Sock Monkeys. 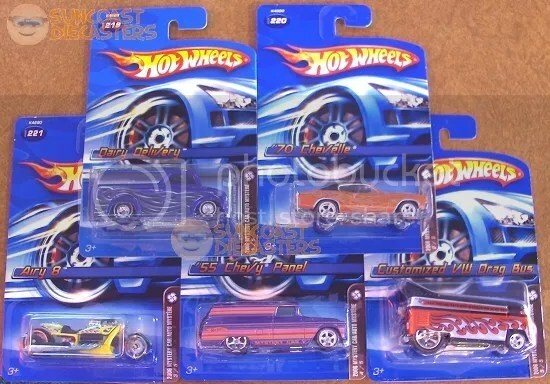 Tom acquired this set of mystery cars from Jeremy. Now, if you don’t understand how cars that are clearly visible through transparent blisters could possibly be “mystery cars”, then I suggest you do a little light reading. Ken’s acquirement. 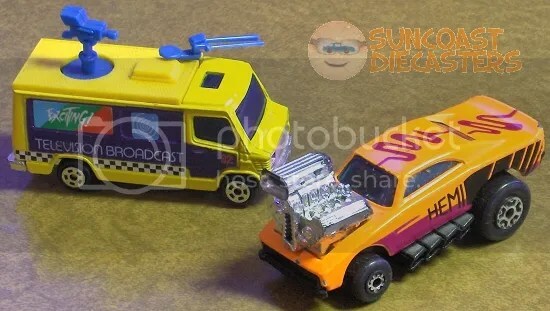 A Budgie Models Fire Chief Car, “Made in England”, No. 27. I know all this because it says so on the bottom. 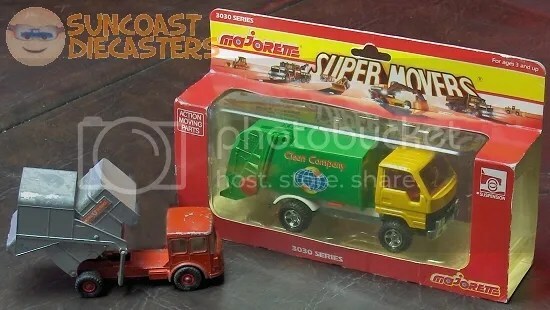 This is the Dodge D-50, bought from Ken by me. 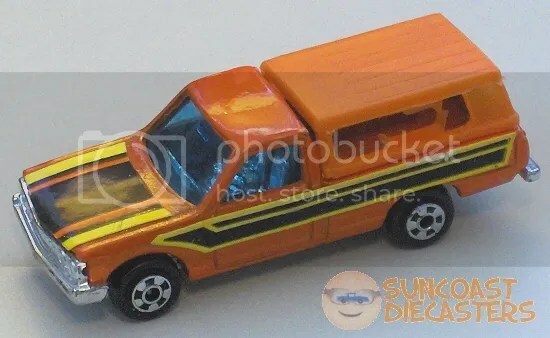 More specifically, this is the Hi-Rakers version of the Dodge D-50. What is, am or are Hi-Rakers? Models which use a patented Rotationally Angular 3-Phase Vertical Regulator to modify the rake of the vehicle’s body. 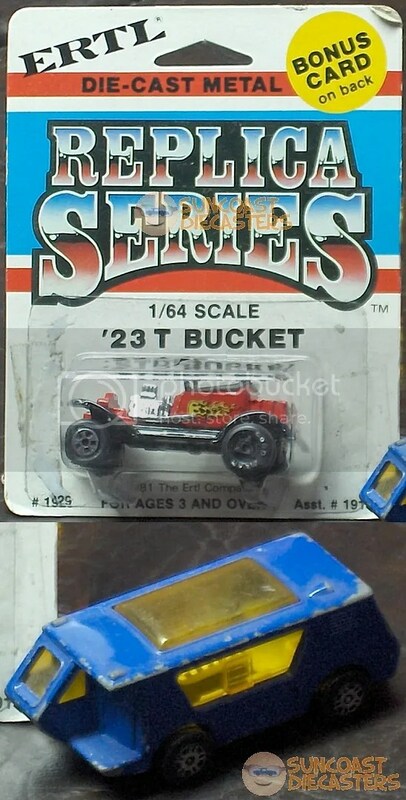 In the second frame below, the truck is in its nominal configuration. 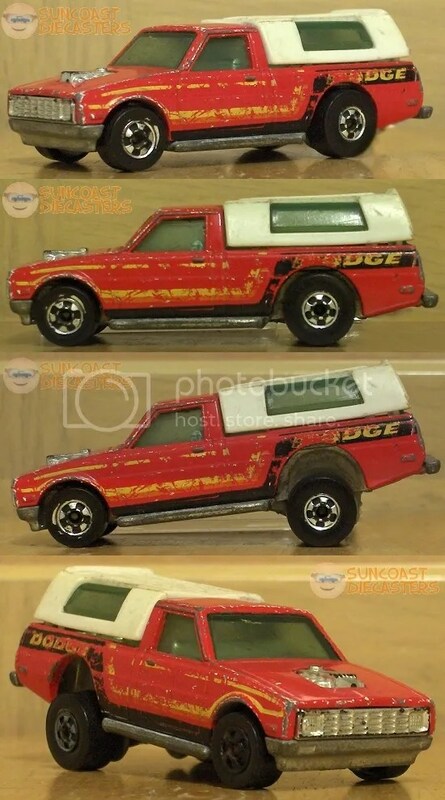 In the third frame, the rear axle is fully extended, giving the truck a much more aggressive stance. Check out frame four. Looks like somethin’ by Trosley, don’t it? Varoom, I say. Bill, ever mindful (and collectful) of variations, sent me this photo of a dual-langauge card. (Just in case you can’t tell, the languages are English and French.) 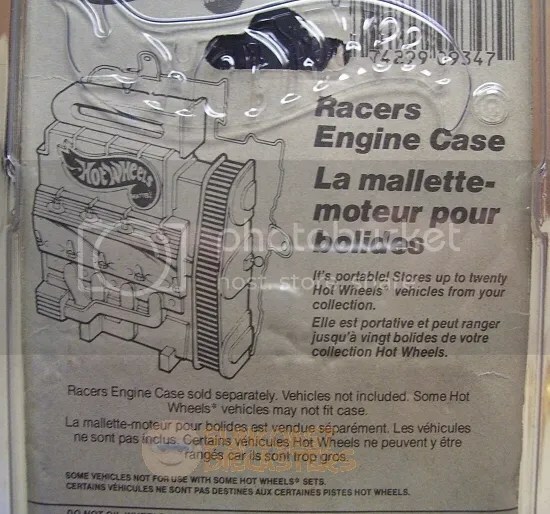 And wonder of wonders, it’s not merely a generic backer; it features an ad for the Racers Engine Case, which happens to be just the thing I picked up from Ed during our December 2012 meeting. 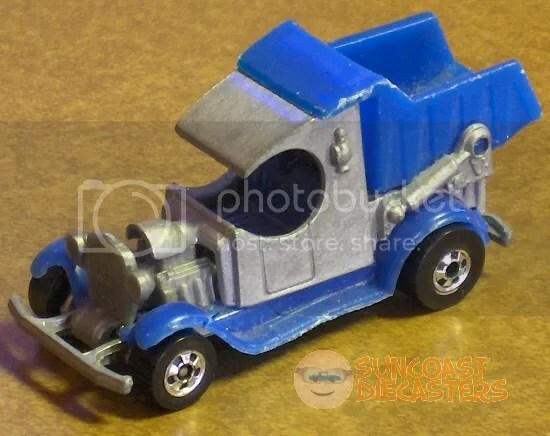 Another Suncoast Diecasters meeting, another new garbage truck for Ken. Or in this case, four. Yeah, four. All at the same meeting. I swear, Ken attracts garbage trucks like … um … like, uh … hmmm. Well, I know there’s a good “like X attracts Y” simile that would work here, but I can’t recall it right now. The glare on the Majorette nearly renders the above photo uselss. (But I used it anyway — see above photo.) So, a re-pose was needed. Besides, it gave me an opportunity to let the vintage truck show off its trick. 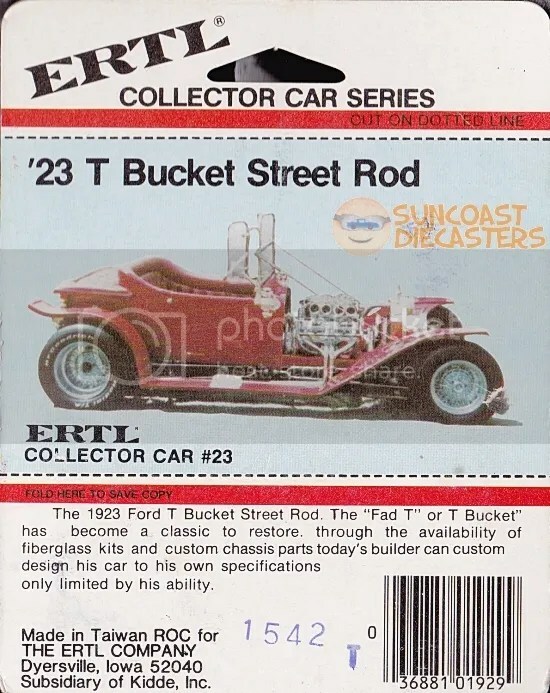 From Big Tractor Mike, I acquired this not-mint-but-still-on-card Ertl T-bucket, which will go nicely with the Ertl T-bucket I picked up at our August 2011 meeting (go see). 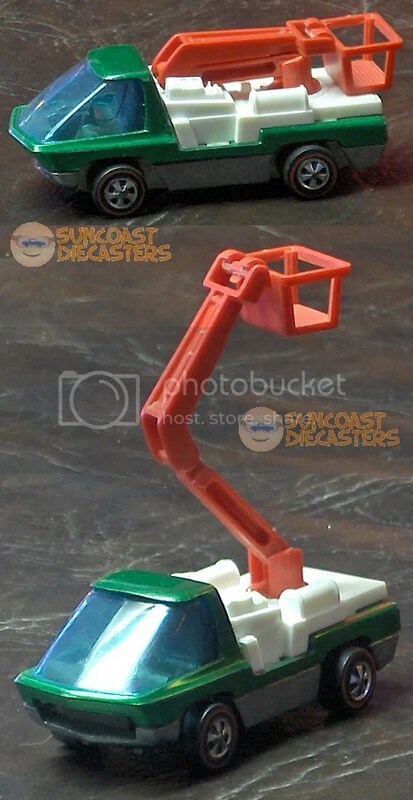 I also got the Corgi WigWam-Van Camper, which came from BTM’s Super-Colossal Collection Purchase (see BTM’s Gallery). 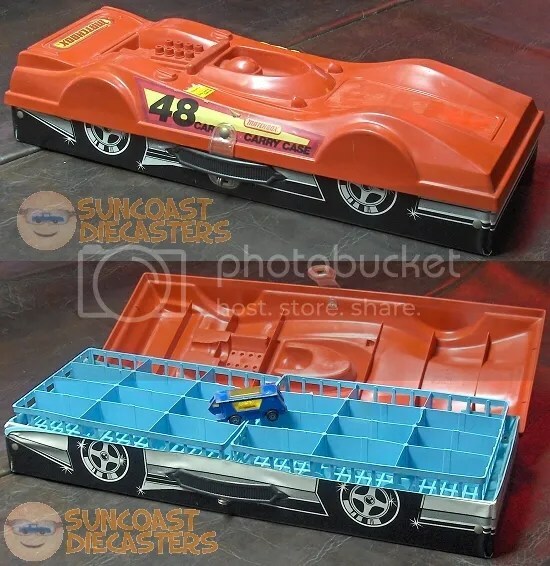 So, what do you get when you take the trays of a 48-car case, which are usually side-by-side on their long sides, and place them end-to-end on their short sides? You get a car! Thanks, Ken!